This Automator tip is for you and, if you’re the cliff notes type, so is the download cheat sheet I created below. While we’re at it, Chris’s entire book of Mac Hacks is up your alley too, you should grab a copy. I’m going to venture a guess that most of you reading this use a MacBook as your primary Mac, and that your iTunes library has grown too big for its britches. You moved it to an external drive, didn’t you? And now you wish there were an easy way to quit iTunes and eject your drive at the same time to bring back that good ol’ fashioned “grab and go” feeling that got you using a MacBook to begin with, right? I think I can help. With a little Automator and a dash of Terminal, you can create a utility that does exactly what I described, which can make your portable life just a little easier. You can put this utility in your Dock or give it a shortcut with a productivity utility like Alfred or LaunchBar—whatever lets you work the fastest. Let’s get started. You’ve now created a utility that quits iTunes. So far, so good. You’re all set. In fact, if your external drive is connected right now and iTunes is running, try clicking the big Run button in the upper-right corner of Automator’s window. If everything’s set up right, iTunes should quit and your drive will be ejected. Now it’s time to save your Automator utility as an application that you can fit into your workflow (you can also download and edit my ZIP file cheat sheet). Go to File→Save, give it a relevant name like “Eject iTunes,” pick a convenient location to save it, and be sure the File Format menu is set to Application. When everything looks good, click Save. Congratulations! To the chagrin of many a music startup and competitor, you just created an, ahem, iTunes killer. Now it’s time to actually use it. You could place your new iTunes killer in the Applications folder and then drag it to your Dock for easy access. Or, if you’re really feeling lazy, you could just put it on the desktop and launch it from there. But there are fairly easy ways to assign this utility a shortcut so it’s just a keystroke away. In System Preferences→Keyboard→Keyboard Shortcuts, you can create a new Application Shortcut by choosing Application Shortcuts in the left-hand list and then clicking the + button. Then browse to your new utility and assign it a shortcut that will make OS X launch your utility and run that series of commands no matter what you’re doing or what app you’re using. Or, if you use one of the Mac’s popular productivity utilities like Alfred, LaunchBar, or Quicksilver, they each have a variation on the theme of assigning a shortcut to any file or folder. In my favorite, Alfred, you do it by going to Preferences→Hotkeys. 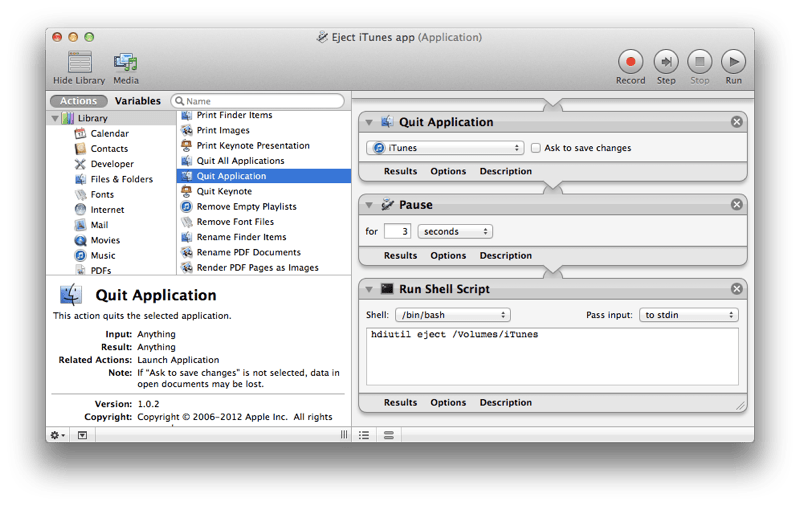 You can also tinker with Alfred’s Extensions panel, where you can create bundles of multiple apps to open or close with a single shortcut. However you decide to work your new iTunes killer into your workflow, I hope it saves you at least a little time fumbling around with quitting the app and then ejecting the drive it depends on. After all, those little bits of time do add up.